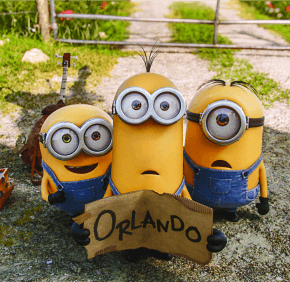 NEW YORK – Fillet it how you will, “Minions” (Universal) is a rare treat. In hauling these sweetly bumbling beings to the fore, and providing them with an ever upbeat — though not always tightly crafted — adventure of their own, co-directors Pierre Coffin and Kyle Balda avoid any genuinely objectionable material. Only a few scenes of combustive mayhem and a couple of mildly out-of-place visuals may give some parents pause. After an origins story that reaches all the way back to the primordial ooze, the proceedings settle down in the swinging London of the 1960s. There, motivated by their natural inclination is to serve a villainous master, the central trio of minions — Kevin, Stuart and Bob (all voiced by Coffin) — assist famed criminal Scarlet Overkill (voice of Sandra Bullock) and her mad scientist husband Herb (voice of Jon Hamm) in their wild scheme to steal the British crown from Queen Elizabeth II (voice of Jennifer Saunders). Narrated by Geoffrey Rush, and interspersed with familiar hippie-era musical standards, the freewheeling plot that follows pursues its own logic down curious courses, some of which feel like detours. But the underlying morality is sound enough. In contrast to Gru, the supposed bad guy of the earlier outings, Scarlet is a truly negative character given to selfishness, greed and disloyalty. Her evil tendencies, which carry straightforward consequences, are all the more obvious when compared to the virtues consistently displayed by Kevin and his pals — an appreciation for one another and a sensitivity to the common good prominent among them. The climactic conflict might prove too much for small fry. In the buildup to it, a few possible irritants for vigilant grown-ups also appear, including a sumo wrestler’s frequently glimpsed backside and the brief presence of a mustachioed bystander whose enthusiasm for Scarlet leads him to dress exactly like her. While treated comically, his quirky behavior may not sit well with some adults. The film contains occasional cartoonish violence, fleeting anatomical sight gags and a touch of scatological humor. The Catholic News Service classification is A-I — general patronage. The Motion Picture Association of America rating is PG — parental guidance suggested. Some material may not be suitable for children.